This is a sponsored post in collaboration with Sleepmaker. This is my dream room. Clean lines, pops of colour, vintage inspired art and candles for days. I could see myself kicking back on my wrought iron bed with a cup of T2 Rose Tea and a good book. But unfortunately this will never be my bedroom, because when you are dating your complete opposite, it is all about understanding. When you have completely different taste in basically everything in life you need to be very, very good at compromise. Opposites certainly attract and E and I are a fantastic pair (if I do say so myself) but when it comes to shopping for our home and decorating we must sit down and come to a mutual decision. We moved in together a good three years ago and when it came to decorating our bedroom it was a drama and a half! Not a bad drama, just a fussy one, because we’re both strong women and both very opinionated. I love colour, prints, clashing the basics and anything quirky. E’s a little more casual and does not share my love of bright colours. She’s a little more “country modern” to my “modern” so our current bedroom is very neutral with a few different bits and pieces to bring our personal style into it. 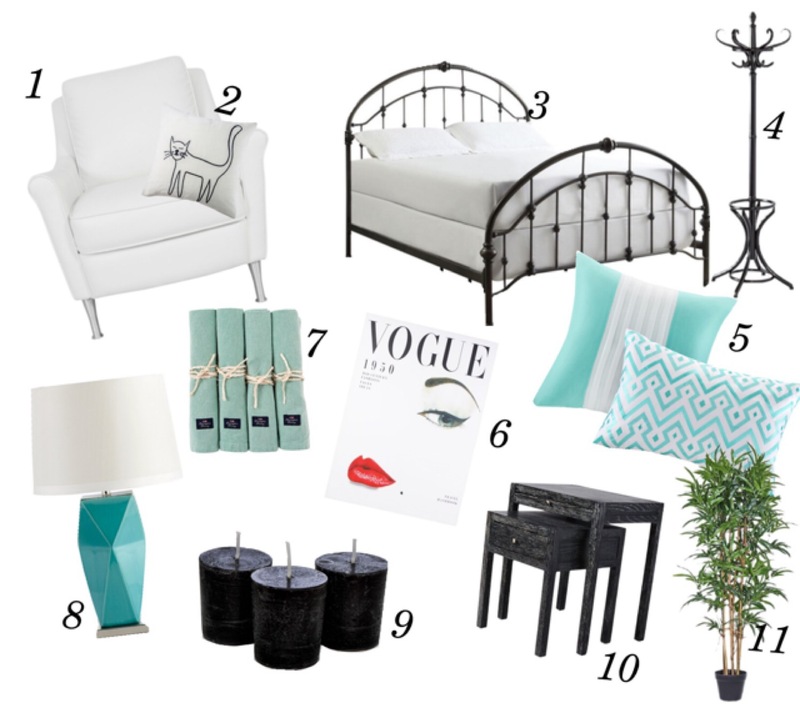 Think black and white bedspread and dark wooden furniture. Thankfully I’ve incorporated my style through some gorgeous artwork, restyled mason jar vases and colourful spined books galore, but it’s not as colourful as I’d prefer. Sad face. One thing we do thankfully agree on in our bedroom is a good quality mattress. Sleepmaker has been around for a lot longer than I’ve been on this earth (70 years!) and you can guarantee good quality with such a well known and established brand. With age comes wisdom, and Sleepmaker have obviously perfected the art of designing and manufacturing a brilliant mattress. If you are sleeping on a comfortable mattress you are going to lead a happy life! A good night’s sleep keeps you feeling healthy, revitalised and fresh, and when you lead a busy life you need to come home to a comfortable bed. What I love most about Sleepmaker is one of the features on their website, a mattress selector survey, assisting you to choose the best mattress for you! According the survey I’m most suited to the Miracoil Advance, perfect for those with allergies (E), back pain (me) and it’s specially designed to reduce hip and shoulder soreness (both of us). It’s also made to reduce “partner disturbance” with its fancy spring technology. This would be fantastic because “apparently” I wiggle around like a worm in my sleep. Apparently. The survey tool also gives you a list of nearby stores to check out. Easy peasy! I can feel a trip to the bed specialists in the near future. I think it’s getting close to new mattress time and I think after describing all the features of the Sleepmaker beauty to my lady, E is in the market for a new cloud! While I sit and contemplate a new mattress, here are my top tips for a fabulous night’s sleep. And not just any tea – T2’s Sleep Tight Tea. It chills you out and tastes amazing! Perhaps you could serve it in a sweet tea cup like this one? If you look good, you feel good. Even in the bedroom. I’m obsessed with these Peter Alexander jammies. Or if you prefer something a little less expensive this Cotton On Body nighty is a winner. I was having so many pillow issues in the past I scrapped the oldies and went out and got myself a brand new one from IKEA. It’s quite hard, but actually supports my neck and shoulders which I need as a side on sleeper. Or the Sleepmaker Serenity Comfort looks pretty good too! This is a hard one for me because I’m a technology addict. Phones in the bedroom are the worst sleep deprivation tool. Phones are like Pringles – once you pop you can’t stop! Turn off that phone and relax… If you can. I love popping a bit of essential oil on my pillow or rocking a lavender eye pillow like this super cute cat one if I’m having a particularly hard time relaxing. I love the smell of real Lavender. And it’s definitely a chill out flower. Do you disagree with your partner about your home interior? How do you get a good night’s sleep? What do you look for in a mattress? Must check out the Sleepmaker site as a new mattress is needed at my house. Thanks.